1958 Ricoh 519 Camera Ad - A Lot for a Lot Less! 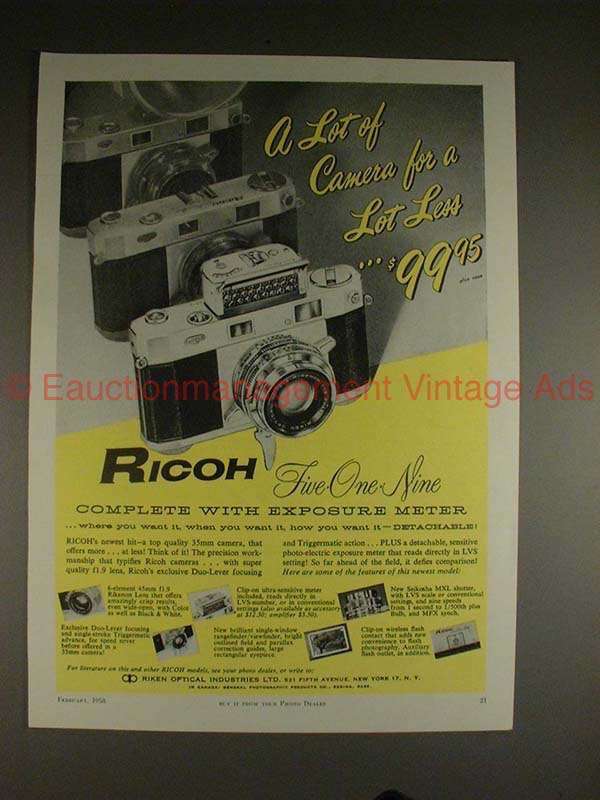 Vintage Paper Ads > Cameras - Photography > Ricoh > 1958 Ricoh 519 Camera Ad - A Lot for a Lot Less! This is a 1958 ad for a Ricoh 519 camera! The size of the ad is approximately 8.5x11 inches. The caption for this ad is "A lot of camera for a lot less!" The ad is in great condition! This vintage ad would look great framed and displayed! Add it to your collection today! 1959 Ricoh 300 Camera Ad - Does Everything Pro 35's Do! 1960 Ricoh 519M Camera Ad - Famous Triggermatic Action!